I reviewed Gunsmoke - The Fourth Season, Volume 1 exactly two months ago. As I noted in that piece, there's not a whole lot to add that wasn't already stated in my reviews of the first season, the the second season, volumes 1 and 2,and the third seasons, volumes 1, and 2. - it's not as if the show's producers suddenly decided to radically change course in mid-January 1959. "Television is crap. All television is crap. Except for sports. And Gunsmoke." Billy must have been watching in early 1959, when Gunsmoke was the No. 1 show in the country, because this set includes many fine examples of what set it apart from its dozens of competitors. The 20 episodes in this set, spread over three single-sided, dual-layered DVDs, look fine as always. Sponsor spots are included as an extra feature, and the disc includes SDH English subtitles, which on my player at least were activated automatically; after a while it was pretty annoying to have to disable this function every time I sat down to watch an episode. U.S. 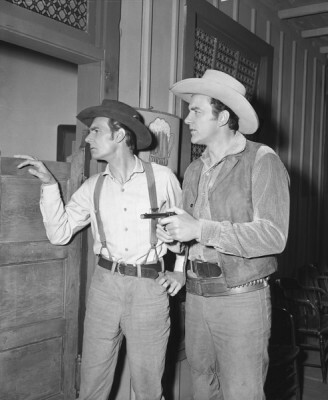 Marshal Matt Dillon (James Arness) and his eccentric, game-leg assistant Chester Goode (Dennis Weaver) are still maintaining the peace in unruly, barely-tamed Dodge City, Kansas. The various gunslingers and cattle rustlers causing Marshal Dillon no end of grief usually can be found drinking and gambling at one of the innumerable saloons. Matt's friend Miss Kitty (Amanda Blake), formerly a (coded) prostitute, is now half-owner of the city's finest, the Long Branch Saloon. She's also its madam, and though the audience doesn't get to see much of that business, it's implied. Matt's line of work often requires the services of cantankerous Doc Adams (Milburn Stone) - Matt, Chester, and Miss Kitty's other close friend. Writer John Meston (1914-1979) was to Gunsmoke what Rod Serling was to Twilight Zone; he penned an incredible 257 episodes of the series during its 20-year run - and that's not counting episodes of the radio show he also wrote (though there was a lot of crossover, apparently). Of the 20 episodes in this set, Meston wrote or co-wrote all of them. Two of his favorite devices are the "What's Going On Here?" and "How's Matt Going to Solve/Get Out of This?" structures, with Matt presented with a puzzling situation/irresolvable conflict at the beginning of the episode, with him and other characters working through the mystery which is revealed/resolved, often violently, at the end. A favorite plot Meston did myriad riffs on has cool cucumber Matt withholding judgment on an accused killer's guilt or innocence while all of Dodge City is ready to lynch the accused. Sometimes in these shows the accused is a friend of Matt's, like Chester, sometimes he's a guest star, but always, even with a mountain of evidence stacked against him, Matt remains calm and just. Writer Costello also gives a lot of credit for the show's success to its co-creator, producer Norman MacDonnell (or Macdonnell), who was with the series from its beginnings on radio, though he was passed over as producer during Gunsmoke's first two seasons in favor of the more experienced (but less talented and, reportedly, much disliked Charles Marquis Warren). The later fourth season shows were mostly helmed by Ted Post, Andrew V. McLaglen, and Arthur Hiller, all of whom would have prominent feature film careers not long after, the first two in Westerns particularly. The less well-known Jesse Hibbs (Perry Mason, The F.B.I.) also directed a few. I didn't watch every episode but several stand out. Beyond the fact that guest star Ken Curtis, future Festus Haggen, shares several scenes with the man he'd replace several seasons down the road, Dennis Weaver, "Jayhawkers," is notable for creating an incredible sense of authentic, Red River-like atmosphere on a TV budget. Jack Elam leads a cattle-drive full of cowboys who hate Kansans on account of Jawhawkers annually determined to see the drive fail. It's a fascinating show; almost nothing happens until the end - it's all about the tension and atmosphere between Matt and Chester vs. the Texas cowboys, all nervously dreading a Jayhawker ambush. "Kitty's Rebellion" is another great show. Billy, a refined young dandy (Barry McGuire) from Kitty's old, upper-class neighborhood in New Orleans, visits her in Dodge, initially unaware of her present occupation. Quite unlike the way these things usually play out, he encourages her to return to Louisiana but otherwise remains nonjudgmental. However, he's offended by the way the locals uncouthly paw at her and, in defending her honor, accepts a challenge from a particularly nasty cowboy. Everyone tries to talk him out of it, but he won't budge and Kitty's terrified he'll be killed. Finally, Kitty publicly laughs at the young man: someone defending her honor? What a laugh - the one woman in Dodge with no honor to defend! Shaken and distraught, the visitor walks out and Kitty's self-flagellation becomes clear. She humiliated herself in order to save him. Guest stars in this set include Jacqueline Scott, Kevin Hagen, Cactus Mack, Howard Culver, Roy Barcroft, Patricia Huston, Wendell Holmes, Bert Rumsey (as Sam the bartender, before Glenn Strange took over), Norma Crane, Russell Johnson, Grant Williams, Denver Pyle (who was signed to play Matt Dillon before Arness replaced him at the last minute; other contenders, according to Costello, included Royal Dano, Raymond Burr, and Peter Graves), Barry Atwater, House Peters, Jr., Barney Phillips, William Phipps, Joe Flynn and Bert Freed (in the amusingly-titled "The F.U. "), Walter Burke, Dabbs Greer, Wendy Stuart, Robert Brubaker, Michael Pate, Hank Patterson, Ed Nelson, Onslow Stevens, James Drury, Harold J. Stone, Darryl Hickman, Charles Maxwell, Joseph Sargent, William Wellman, Jr., Ted Knight, J. Pat O'Malley, John Larch, Victor Lundin, Strother Martin, John Mitchum, Monte Hale, Gene Nelson, Walter Brooke, Eddie Little Sky, Chuck Roberson, and Edward G. Robinson, Jr.
As before, Gunsmoke looks exceptionally good on DVD. Shows are bit overly grainy but otherwise very sharp, very clean. The 20 black and white episodes are spread over three discs, with a total running time of about eight hours and 43 minutes. The Dolby Digital mono (English only) is clean and clear, and the show is closed-captioned. The packaging allows viewers to read the episode descriptions inside the snap case without having to remove any of the discs. Included are pristine original opening titles (unlike the much grainer syndicated versions that open each show now) noting the fourth season sponsors, Remington, makers of the Auto-Home Rollectric, an electric razor, "the kind of gift every man'll go for," says Arness, from his "dressing room." Later, in character (though using a modern lighter), he extols the virtues of L&M cigarettes. These shows are musts for Western fans, especially for those who only remember Gunsmoke's later, less interesting color and hour-long shows. Taut half-hours, movie-like and, at times, unexpectedly grim, Gunsmoke is classic American television at its finest. Highly Recommended. Film historian Stuart Galbraith IV's latest book, Japanese Cinema, is on sale now.